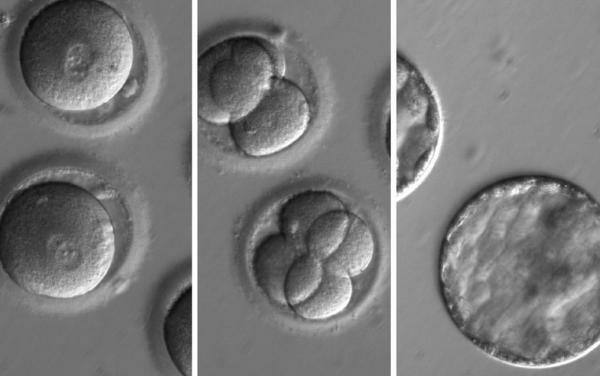 This sequence of images shows the development of embryos formed after eggs were injected with both CRISPR, a gene-editing tool, and sperm from a donor with a genetic mutation known to cause cardiomyopathy. Shoukhrat Mitalipov points to an image of an edited embryo inside an incubator at the Center for Embryonic Cell and Gene Therapy in Portland, Ore.
She's just gotten a call from the fertility clinic three floors down. A woman undergoing in vitro fertilization has had her eggs extracted. One of the eggs is too immature to be used to try to create a baby, so she's donating it to research. Koski grabs a small metal box and rushes to the elevator. It's her portable incubator. "You want to keep the eggs very happy and warm," she says. "When you're jostling them and moving them, they get a little unhappy." Human eggs are the key starting point for the groundbreaking experiments underway in this lab. It's run by Shoukhrat Mitalipov, a biologist who's been on the cutting edge of embryonic genetic research for decades. 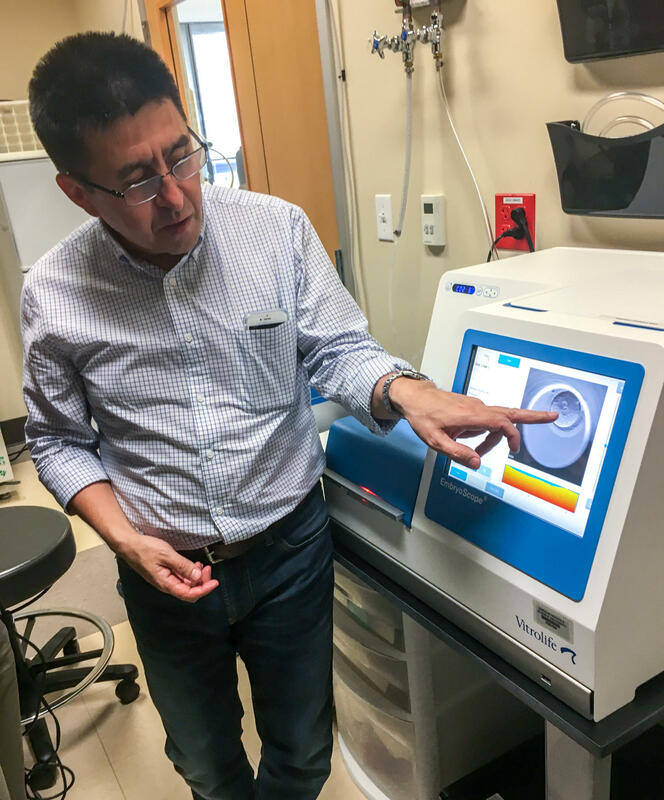 Mitalipov and his international team electrified the world this summer when the group announced it had successfully — and seemingly safely — figured out how to efficiently edit the DNA in human embryos. For the first time, they said, they had corrected a mutation that causes a potentially fatal heart condition. The hope is this landmark step could someday help prevent thousands of genetic diseases that have plagued families for generations. Critics, however, pounced on the news. They fear editing DNA in human embryos is unsafe, unnecessary and could open the door to "designer babies" and possibly someday to genetically enhanced people who are considered superior by society. I've followed Mitalipov's research for years and have visited the labs of other scientists doing related work in Stockholm, London and elsewhere. Still, I stepped into Mitalipov's embryology lab unsure of exactly what I was about to see and eager to better understand what allowed these scientists to succeed where others had failed. "This is our small room, but that's where usually lots of big science happened," says Mitalipov, who was born in the former Soviet Union. "We believe this room is really magic in terms of science." He points to a microscope where his colleague, Nuria Marti-Gutierrez, has just positioned a Petri dish. I'm able to watch everything she's doing on a computer screen. Mitalipov points to a round silvery blob. It's the egg. "You can see it moving," he says. Suddenly, a bunch of tiny ovals flit across the screen. They are sperm from a donor who has a genetic mutation that causes cardiomyopathy, a potentially fatal heart condition. Marti-Gutierrez draws the sperm into a thin glass rod called a pipette. She then adds a microscopic gene-editing tool — a combination of chemical sequences known as CRISPR – that can make very precise changes in DNA. In this case, CRISPR will zero in on the cardiomyopathy mutation to literally slice the defect in the DNA. Finally, she pierces the shell of the egg with the pipette and injects the sperm and CRISPR. Almost before I know it's happening, it's done. A human embryo has been created and edited before my eyes. "Yep," Mitalipov says, chuckling to himself. It was amazingly fast and seemingly easy — you could imagine a future where this sort of thing might become routine. "This is how we do it," Mitalipov says matter-of-factly. He refers to the process as "DNA surgery." Mitalipov and his team immediately do a second edit and then transfer the embryos to a larger incubator. The scientists will then spend the next few days monitoring live video of the two embryos, along with 17 others they had edited the weekend before, to see how they develop. Mitalipov thinks his team accomplished this feat by injecting the mutant sperm and the DNA editor into the egg at the same time. Previous attempts to edit DNA in human embryos were far less accurate and produced dangerous mutations elsewhere in the embryos' DNA. Mitalipov and his colleagues are not sure exactly how it works. But they think that when CRISPR cuts the defective gene, the slice triggers the embryo to repair itself. If future experiments confirm the results and show that the technique also works for other mutations, Mitalipov thinks the process could wipe out many diseases that have plagued families for generations, though he cautions that any practical application is still easily a decade or more away. "[There are] about 10,000 different mutations causing so many different conditions and diseases," he says, pointing to Huntington's disease, cystic fibrosis and even possibly inherited forms of Alzheimer's and breast cancer. "We're talking about millions of people affected. So I think the implications are huge," he says. "I think this is a significant advance," says George Church, a Harvard geneticist. "This is important not only for parents who want to have healthy children, but more generally, it opens the door to preventative medicine where we can avoid a lot of painful genetic problems." While the results seem promising so far, there are still many questions. Some scientists remain skeptical that Mitalipov has really done what he says he's done. "Unfortunately, the data do not allow the conclusion of correction for the embryos," says Dieter Egli, a biologist at Columbia University. "There are a number of other outcomes that are much more likely." Mitalipov acknowledges that his work still needs to be reproduced by others, but he is confident his method is working. Others are worried that less careful scientists might rush ahead too quickly and attempt to make babies before the technique has been proven to work and be safe. "This is a strong statement that we can do genome editing," says George Daley, dean of the Harvard Medical School. "The question that remains is, 'Should we?' "
"I think it would be professionally irresponsible for any clinician to use this technology to make a baby," Daley adds. "It's just simply too early. It would be premature." The idea of changing human DNA in ways that could be passed down for generations has long been considered off-limits. The fear is scientists could make mistakes and create new diseases that would persist for generations. Some critics go so far as to say that scientists are essentially playing God by taking this step. They fear it will lead to parents picking and choosing the traits of their children. While that is not yet technically possible, critics say scientists are moving quickly toward that possibility. "I think it's extraordinarily disturbing," says Marcy Darnovsky, who heads the Center for Genetics and Society, a watchdog group. "We'll see fertility clinics advertising gene editing for enhancement purposes. We'll see children being born who are said to biologically superior." Mitalipov and his colleagues acknowledge the fears and agree the technique should be carefully regulated and only used for medical purposes. But, they argue, the fears should not stop the research. "I don't think I'm playing God," Mitalipov says. "We have intelligence to understand diseases, eliminate suffering. And that's what I think is the right thing to do." Scientists recently made headlines when they announced they had figured out how to edit DNA in human embryos for the first time. This week, the scientists invited NPR health correspondent Rob Stein into their lab in Portland, Ore., to watch them edit the genes of these human embryos. He is the first journalist to do this. And I am so glad he's in the studio right now because I cannot wait to hear more about this. Hey, Rob. ROB STEIN, BYLINE: Oh, hey, Ailsa. CHANG: So you got the first invite as a reporter to watch them do this. What was that like? CHANG: It's literally made hereditary. STEIN: That's right. Every generation to come could inherit whatever changes they make in the DNA. STEIN: And what they did is they let me watch every step of the process. They let me watch as they created embryos in their lab specifically with genetic mutations so they can then go ahead and fix the mutations and make the embryos healthy. CHANG: Wait, so how exactly do you edit the DNA in an embryo? AMY KOSKI: We're on the 13th floor. STEIN: ...In a lab with Amy Koski. She's the lab manager. And she just got a call from a fertility clinic three floors downstairs. KOSKI: I've been instructed from the fertility clinic that they have an egg that we're ready to go pick up. Should we just go do this thing? STEIN: She grabs a metal box that looks sort of like a lunchbox and we head for the elevator. KOSKI: This is our portable incubator which keeps the eggs warm while we're moving up and down the elevators. STEIN: We rush to the clinic. Doctors there are removing eggs from a woman going through IVF to try to have a baby. KOSKI: You want to keep the eggs very happy and warm. And when you're jostling them or moving them, they get a little unhappy. STEIN: When we get downstairs, a doctor in scrubs opens a big incubator to get what was collected just a few moments ago from the donor in a nearby room and gently places a dish inside Koski's portable incubator. STEIN: And then we walk really slowly back to the elevators. KOSKI: Every single time. By the time I get upstairs, I take a deep breath for the first time and I pause and think, oh, today, I didn't drop anything. STEIN: Back upstairs, we head into a small, dark room. KOSKI: And we're going to very carefully transfer from the traveling incubator into what we call our waffle makers, which are just benchtop incubators for embryos. STEIN: Moments after the eggs are safely inside, the door opens again. MITALIPOV: Good, thank you. Nice to meet you - Shoukhrat. STEIN: It's Shoukhrat Mitalipov. He's a biologist born in the Soviet Union who runs the lab. MITALIPOV: Good to have you. So this is our small room. But that's where usually lots of big science happen. STEIN: Big science? What do you mean by that? MITALIPOV: We believe this room is really magic in terms of science. And lots of big discoveries came in this room, particularly this microscope. STEIN: He points to a big microscope where another scientist is positioning a petri dish. She flicks on a light that makes it glow in the dark. Everything she's doing is projected onto a computer screen. MITALIPOV: She's loading now eggs. You see? That's a human egg. STEIN: That's a human egg? MITALIPOV: Yep, yep. That's a mature human egg. And you can see it's moving - so actually, two of them there. See? STEIN: So that's two healthy human eggs? STEIN: They look like round, shimmering, silvery blobs. Suddenly, a bunch of tiny ovals flit across the screen. MITALIPOV: These are sperm. You see? Floating sperm - and they twitching. STEIN: Oh, yeah. They're like - have a little tails and, like, swimming. MITALIPOV: Yeah, yeah. So yeah, that's how we know that sperm is feeling well and it's swimming. STEIN: But these aren't just any sperm. They're carrying a genetic mutation that causes a potentially fatal heart condition. The scientists are fertilizing the eggs to create embryos that carry this mutation to see if they can fix them. A long, thin, pointy glass rod appears on the screen. MITALIPOV: Can you see this pipette - tiny pipette? STEIN: A pipette is like a needle? MITALIPOV: Yep. It's a microscopic needle. STEIN: So she's sucking some of the sperm into the hollow glass needle, the pipette? STEIN: Then she draws something else into the pipette with the sperm. It's a microscopic gene editing tool that lets scientists make very precise changes in DNA. It can zero in on the genetic mutation and literally cut it out, creating a healthy embryo. MITALIPOV: And now she'll be shooting that sperm along with that DNA correction solution. And it's all done. STEIN: She just did it? STEIN: Wow. She just shot it right in there. STEIN: Wow. That was amazingly fast. MITALIPOV: This is how we do it (laughter). STEIN: Mitalipov says this is how his team succeeded where others failed. They injected the mutant sperm and the DNA editor at the same time. Basically, what we just saw you do was you fertilized an egg and did kind of DNA surgery on it all the same time. MITALIPOV: Exactly. So this is DNA surgery. STEIN: They're not sure exactly how it works. But they think when the defective gene is cut out, this triggers the embryo to repair itself. Mitalipov says this procedure could wipe out a long list of diseases that have plagued families for generations. MITALIPOV: The estimate is about 10,000 different mutations causing so many different conditions and diseases. STEIN: Like Huntington's disease, cystic fibrosis - even, possibly, inherited forms of Alzheimer's and breast cancer. MITALIPOV: And we're talking about million of people affected. STEIN: Now, this all may sound pretty great. But there are still lots of questions about it. CHANG: Yeah, like what kinds of big questions? STEIN: Well, first of all, Ailsa, there are some scientists that are still skeptical that Mitalipov has really done what he says he's done. And this is pretty common in science. Whenever anybody makes a big discovery like this, nobody's really sure until somebody else is able to do it themselves. Another concern is that some scientists may kind of rush ahead with this and try to make a baby before anyone knows for sure that it works and it's safe. CHANG: Even if it is safe, it's still really controversial, right? STEIN: It's incredibly controversial. I mean, scientists, they could make some kind of mistake and create new diseases that would then be passed down for generations. STEIN: ...And genetically enhanced people. And I asked Mitalipov about this. And this is what he said. MITALIPOV: I don't think I'm playing God. We have intelligence to understand diseases, eliminate suffering. And that's what I think is the right thing to do. CHANG: Wow. It's just so fascinating that you were on the front lines of genetics. Thank you so much for coming in and teaching us about this. CHANG: That's NPR health correspondent Rob Stein. Transcript provided by NPR, Copyright NPR.